The Panasonic Lumix DMC-FZ48 is an update to last year's DMC-FZ45 resembles a shrunken digital SLR, although it incorporates a fixed lens and electronic viewfinder, both of which jut out from the body. Once again,it fields a 24x optical reach, taking it into the 'super zoom' or bridge camera product category. In this respect it goes up against the slightly higher-powered likes of the Fujifilm Finepix HS20, Canon PowerShot SX40 IS, Olympus SP-810 and Nikon Coolpix P500, to name a few big zoom rivals. The pitch with the DMC-FZ48 is that with a focal range this broad, the equivalent of a wide 25mm-600mm in 35mm film terms, meaning that it's excellent for candid portraits (or 'snooping'), it doesn't matter that the lens cannot be swapped. It is also a far cheaper, more practical and portable proposition than equipping a digital SLR with a 600mm telephoto. OK, so you won't get images quite as pin sharp, as the sensor isn't as large as a DSLRs for one, but for most amateurs the DMC-FZ48 will be a fair compromise between quality, versatility and price. Unusually, the stills resolution here is a modest 12.1 megapixels – two million fewer than the FZ45 – but this is bolstered by Full HD 1920x1080 video with the benefit of stereo sound via two top mounted microphones, whereas the FZ45 offered just 1280x720 pixel clips. The suggested retail price for the Panasonic Lumix DMC-FZ48 is £349.99, some £20 cheaper than its predecessor too. Everything about this camera is chunky, including a robust handgrip and a stiff ten pence piece-sized shooting mode dial that is its 'nerve centre'. Among a busy 14 options are fully automatic subject-recognising 'iA' mode, plus creative controls such as program, aperture priority, shutter priority and manual mode settings. Although there is a movie setting it has also been given its own record button, so filming can commence no matter which other mode happens to be selected at the time. Since Panasonic has stopped making digital SLRs, some technology has naturally trickled down to the FZ48 from its Lumix G compact system family, such as Creative Control and Picture Style modes that allow the sort of in-camera dynamic boost to a shot that previously required the likes of Photoshop. 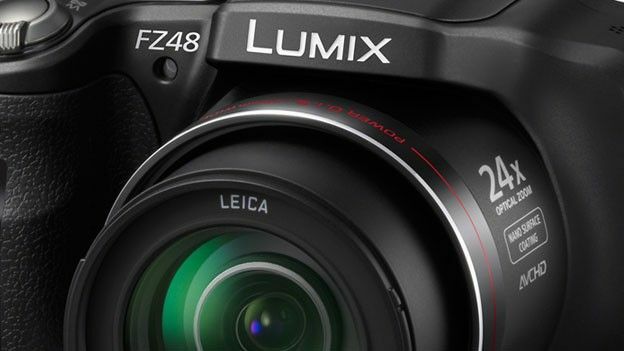 The lens, certified by enthusiast's fave Leica, also comes supported with an optical image stabiliser to minimise blur when shooting handheld. It's not always effective, but better than nothing. With large well marked controls and the option to shoot in manual and fully automatic modes, the Panasonix Lumix DMC-FZ48 generally positions itself as a jack-of-all trades device that can be as simple to use or as involved as you want it to be. While rivals may offer tilt and swivel screens, the DMC-FZ48 comes with a resolutely fixed 3-inch 'intelligent' LCD screen for shot composition and review. While we slightly missed an adjustable LCD, this also comes with the aforementioned electronic viewfinder (EVF), as a smaller alternative, directly above. Some will find this useful in bright sunlight or simply prefer it out of habit of using the optical variety; however we mainly stuck to the LCD simply because for us the larger view it provided made it easier to check critical focus. This choice was further made simple by the fact that screen resolution has been doubled from the 230k dots of its predecessor to 460k on the DMC-FZ48. By contrast, the smaller EVF manages just 201k dots, so found us squinting. A slide of the top mounted on/off switch and the FZ48 readies itself for action in just under two seconds – not bad for its class – the lens adjusting to maximum wide angle setting with a low mechanical whirr, and the rear LCD blinking into life. Should you want it to, this Panasonic is capable of shooting 3.7 frames per second (fps) at full resolution, a performance whilst no great shakes in isolation, at least makes it comparable with a starter DSLR. Otherwise the camera responds nigh instantly to each button press and menu selection. Though its physical bulk suggests it could slot in a handful of AAs, the Panasonic Lumix DMC-FZ48 in fact comes equipped with a DMW-BMB9E rechargeable lithium ion battery, with mains charger provided in the box. This is good for approximately 400 pictures from a single charge, according to industry testers CIPA, which is plenty. In our experience we were using it on and off for a week before the battery bar started to show a third depletion. The Panasonic's zoom lens may be a very versatile tool when it comes to quickly framing up your shot, but so too is its bright/fast maximum aperture: here a respectable f/2.8. Photo Style options if you do want to add visual pep, though again don't come expecting sharpness on a par with a DSLR. Just so it's not classified as a camcorder under current directives, the FZ48 can also shoot Full HD video clips of up to 29 minutes, 59 seconds in duration. It's when shooting video that the dedicated record button and also the versatility of that zoom come into play, though the image will blur before automatically snapping into sharp focus if you do alter framing while recording. There's the choice of shooting AVCHD at full resolution or dropping down to 120x720 to record in MPEG4 format, and at 25fps. Though in many ways this Panasonic is a DSLR 'lite', at a fully loaded 498g it's ironically fairly weighty. In addition, because of the paparazzi-like lens reach, it boasts chunky proportions that are too much of a squeeze for the average pocket. That said, there will be those who find reassurance in that self-same robustness; this is a bridge camera that feels like it will withstand the odd knock, as long as the lens isn't fully extended (and so fully exposed) at the time of any clash. If you're not put off by the relative bulk, this is a good option for someone looking for one camera that does (almost) everything.